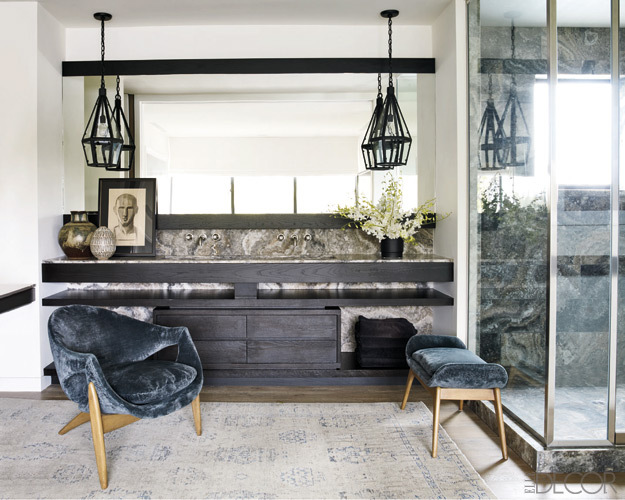 I stumbled across pictures of Courtney Cox's Malibu retreat renovated by architect Michael Kovak and designed by Trip Haenisch and fell in LOVE - deep love. A simple, clean aesthetic, mid century structure, neutral tones, and unbelievable views of the Pacific Ocean make this my dream abode. The two acres of land include guest cottages, a tennis house and court, a screening room, and a salt water pool. Note: The TV is mounted into the flagstone fireplace. The vintage bar stools add the perfect touch of rustic to a modern kitchen. The light fixture is from Nessen Lighting. Note: The view is simply stunning. Note: The artwork was done by Cox's father while he was in high school. Custom made head- and foot boards are zinc. 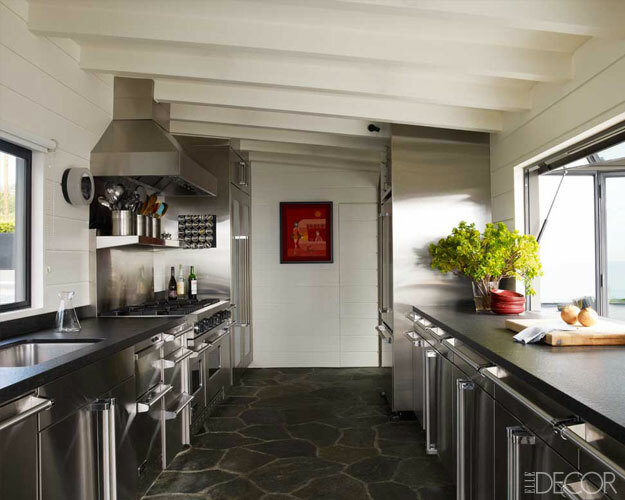 Kitchen in the screening house. Custom made pool table and painting by Arsen Roje. French doors open up to the pool area and views of the Pacific Ocean. Dreamy. The pool overlooking the Pacific Ocean is filled with salt water. Absolutely fabulous and I love the artwork!! This is amazing I loved everything especially the firepit outside. Could you imagine reading a book on that couch with the fire going and listening to the ocean. So perfect. This is definitely one of my all time favorite homes! Yup, I could easily live there. Sign my up! So stunning. That outdoor seating area is perfection. I'd pack my bags in a second if I could live there! Wow I'm just imagining what it must be like to site outside when the sun is setting ..so beautiful. This is gorgeous! Love the artwork by her dad. I saw this feature a few months ago and about died. 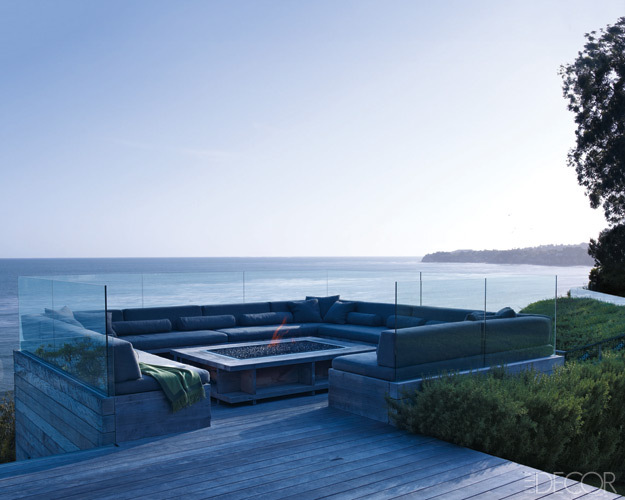 That outdoor space is just unreal! When can we move in? Booking ticket now. So dreamy! Thanks for sharing! Her house is amazing. Especially that outdoor area. The view, the fire pit. Awesome. Love every aspect...so fresh and clean! She has such a gorgeous aesthetic! Very contemporary, but pretty too. Love the white kitchen. Love. That house is perfection. Love the openess of it and how sleek and modern it is! This home is gorgeous, no doubt about it! I love the outdoor seating area with the fire pit, it's perfect for enjoying the outdoors! P/S: I am hosting a fab giveaway so come by and enter a chance to win a $50 Kirkland's gift card if you like! I love how the TV is mounted in the fireplace. 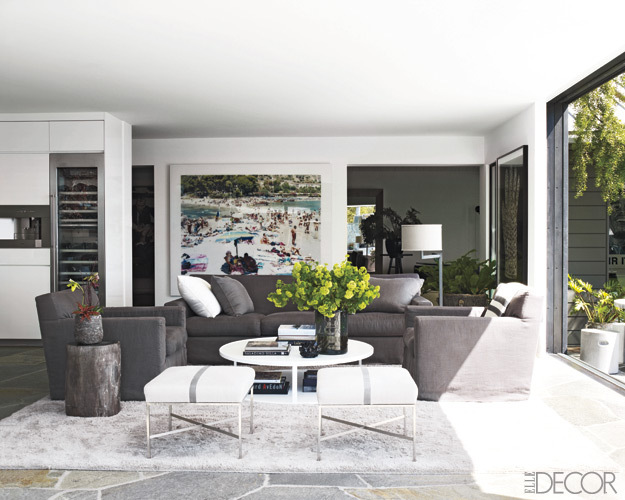 What a beautiful space, love how it blends the outdoors and the indoors. I feel like I could write a paragraph on how stunning each image is, but I'll spare you that much. Amazing find. I need to go there stat. love the blog doll! can't wait to read more! stumbled onto your page while "blog" walking and thought i would say a little hello! i have a :very delicious giveaway on my blog. ould love it if u can take a look. I mean, when can we move in?! GORGEOUS home. I think I could get used to all those windows. And the view. And the pool. And the outdoor fire pit. Her house is stunning! I am usually not into such sparse spaces, but the views are really all you need — ever. I love love love this spread!!!! Think they will invite us over? I found your blog from Small Shop, so nice to come across it!! !